The setup is very similar to Over The Hedge (which it should be, seeing as how it is the same publisher (Activision) and the same developer (Vicarious Visions). The setup is quick and easy with one-touch activation but with a long opening sequence before you can start. Once you get to the main menu (after the opening sequence), it's a one click activation on a large field labeled "Host A Multiplayer Game". If only all games made it this easy! Just one question: during the downloading process, while the lemurs are dancing from one DS to another on the lower screen, why do the two DS systems look like they're underwater? The basic goal in the game is to protect the lemurs and defeat the foosa. This becomes obvious about 15 seconds into the game. Both players work cooperatively and, as a result, both players win or lose. This becomes obvious at the end of the first game you play. How the scoring system works and how (and when) the number of saved lemurs changes is not all that obvious. As a result, the programmers decided to explain the concept while the game is downloading. The problem is that if you blink, you miss it. Because the game downloads quickly, the description diappears just as quickly (actually, each third of the 3-screen descriptions disappears 3x as quickly, but who's splitting hairs?). It actually took me half a dozen connections to get all three screens recorded correctly (to be honest, one was for punctuation - yay for accuracy!). Why not put a clickable "Description" option on the screen where the entire thing currently houses "Easy", "Normal", or "Hard"? The game looks fine in an aptly-applied 2D/3D-combined look. There's no voice over, just sound effects and music, and nothing fancy. You can't choose which player is which character unless you trade Nintendo DS systems temporarily. Why is that? What you can choose, and the only thing, is the difficulty. On any game where the complaints outnumber the comments, I'm going to make a mention here of the fact that I am only reviewing the Single-Card Download functions and features of the game and not the main single-player game that people usually purchase the title for. The main single-player game is not great, but it's not bad. It's not as good as Over The Hedge, but Madagascar came first and they improved the main single-player games over time, which is expected. Once again, this game gives a whole new meaning to the "Mini" part of "Mini Game". 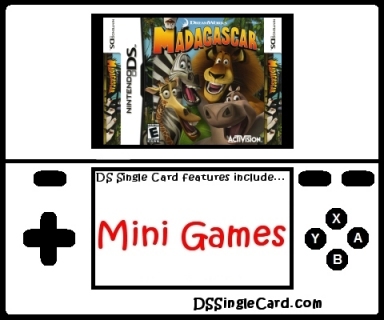 Just to be clear, I have no problem with really, really miniature mini games, but I will say that most games that bother to put mini games on a Nintendo DS game using Single-Card Download tend to put more than one. I could probably come up with a dozen in a one or two hour brainstorm session that would fit in with the movie's themes. And yes, if I review a game that is movie-related, I DO watch the movie before I review the game - every time. In one final comparison to Over The Hedge, I think that the Single-Card Download mini game featured here is better, even though it came first. I believe this because this game forces both players to play cooperatively, which is fairly rare in video games in general these days. It's a great start. Next, you need to give the game more depth and have it last more than one minute per play. Let the players choose their character. Give more in depth options: select the speed of the foosa and the frequency, not just "Difficulty". Allow Melman and Gloria to be playable, even if you have to download the game and the character separately. More than one mini game. Click here to return to the DSSingleCard.com Madagascar profile.